in Admin Area, Option, I creat 1 options. In option created, i creat one option and select image. I doing upload the imagem and save. In one Product, I select Options, search of option created, select and save. In front and, the image not show. Other options (Select, Radio, Checkbox) work fine, but image not show with option of product. you need to select image and not option. Daniel wrote: you need to select image and not option. i've get same problem, but i dont understand, when i put an option in Catalog----> Options-----> Colors--- i write red for example and i select an image red. In front when i buy that items i'd get an option Colors with checkbox called red and an image red? The image field does also show for SELECT and RADIO option types, but this appears to be by mistake. The actual image only shows on the product page if you choose the "IMAGE" option type. I have tried to create the options with images but it doesn't work for me, not even using the configuration shown in the attached image. Can you advice? Is there anyway of making the the option thumbnails a bit bigger or adding a pop up image when selected/hovered over? I'm a newbie so would be happy to buy an extension to do this, But I am learning more and more about code so if the answer is in a coding change, would be most grateful if it were explained in an idiot proof way. Hey All I tried selecting the image option and then uploading images for that option, I then went to the product and added that option but I still don't see it on my product page. Does anybody know why? Did you put enough quantity for this option specific in the product options? I am having the same exact problem, I set up the option, added the images and applied the option to the product and is says available options but does not give any options to choose. I did but it is still not showing up. I then tried making this option to a file type to see if it would show up on the product page and it does but as an upload option, but when I change it to image and then go to the specific product and add that as an option it does not show up on the products page. I have made this option a required field so on the products page it doesn't let me add the products to the cart because I have not selected a color (image option), but the thing is that I can't because I don't see the field on products page. Are you using custom theme? The theme should have support for image options. If it's not being shown in the default theme, then it's because you have not added enough quantity for this image option in the product data. I'm saying about that screen where you link this image option to the product itself, and you can select if each image will cost +/- than a product without the options. There are also a quantity field. If you select to monitor the stock, it should be set to 1+ to be shown in the product page. This is the missing code that prevents your CUSTOM template from displaying the images/swatches. Hope that helps. Last edited by i2Paq on Fri Feb 24, 2012 4:22 pm, edited 1 time in total. Quick question though- Is there a way so make those images bigger? just change the resize values from 50,50 to what ever you want. as a side note i've actually just release a mod for this almost. instead of an additional image that changes with the selection, this allows for images in the dropdown itself. 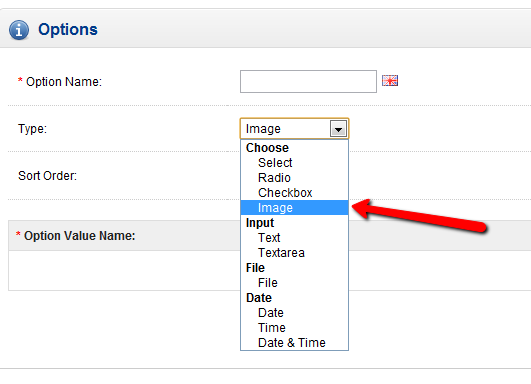 Any options that are "select" based can have images associated via the standard admin interface. These will then be displayed as image dropdowns on the product pages that use these options. Also allows for css styling of your drop-downs. Bg-foxx, just wanted to say thank you for providing that fix. It worked like a charm.